Reinventing itself somewhat, AMD launched a new notebook processor a couple of weeks ago. Known previously by the codename of Llano, this new chip combines up-to four Phenom II-type CPU cores and a low-end Radeon HD 5500-like GPU on one bit of silicon. The benefits for bringing the CPU and GPU together on a notebook platform are considerable. Less silicon is used, which is good for AMD's bottom line. There's finer control over how each part functions, and an APU lets AMD cram in more computational oomph for a given power budget. Released with standard 35W and 45W TDPs and differentiated by the usual array of speeds and feeds, our review of an AMD-supplied Llano notebook found that the solid APU technology would work well if the likes of Dell, HP and Acer took it on. Cutting-edge technology is prohibitively expensive to produce, running into billions of dollars for new fabrication plants and associated tooling. This is why both AMD and Intel's latest chips - and they all use integration of CPU and GPU - span the consumer and mobile markets with a similar processor architecture, albeit tweaked for purpose. Intel's Sandy Bridge desktop chips, for example, are practically identical in design to the mobile offerings, though more power is enabled by the larger thermal budget. Likewise, AMD is scaling up the Llano core and launching it as a desktop chip, to be purposed for mainstream PCs. Our intention is to see just how that has been accomplished and whether the desktop processor can take on price-equivalent Intel Core i3 chips. Desktop Llano's architecture is identical to the notebook version's. Rather than rehash what we have already written about it, please head on over to here for an exposition of its features and design philosophy. But the one real advantage of a desktop chip is that it's not constrained by the same thermal considerations as a mobile part. Whereas, understandably, the top-line mobile APU runs with a 45W TDP, to fit into mainstream chassis with, say, 15.6in screens, the desktop chips can use a full-sized motherboard and aftermarket coolers. To this end, AMD is releasing four desktop models with either a 65W or 100W TDP. And here they are. The extra TDP is put to use through increased speed for the CPU and GPU. Specifically, at the time of launch, there will be only two A6 and A8-designated APUs. Each model will have a representative in the 65W and 100W classes, and the lower-wattage APUs will have Turbo Core support, where the CPU frequency is increased if applications take advantage of only a few cores. It's disappointing to see that AMD isn't specifying this performance-boosting feature on all chips. Understanding that system memory bandwidth is a crucial determinant of overall performance, as the entire APU chip - CPU and GPU - is fed from one memory source, AMD increases official speeds to 1,866MHz, up from 1,600MHz on the laptop variant. AMD employs the same strategy on the GPU part. Keeping the architecture identical to the mobile APUs for the A8 and A6, clockspeeds see a healthy boost on the range-topping part. The desktop Radeon HD 6550D in the A8 runs at a maximum 600MHz core and 1,866MHz memory (system RAM speed), compared to 444MHz core and 1,600MHz memory in the equivalent Radeon HD 6620G for the notebook. Meanwhile, the desktop A6's gain isn't as impressive, rising from 400MHz/1,600MHz on the mobile HD 6520G to 443MHz/1,866MHz for the HD 6530D here. Again, AMD doesn't implement a Turbo Boost-like feature for the graphics; they can only run at the maximum stated speed irrespective of overall APU utilisation. Much like the laptop part, and we've said that a lot in this discourse, the Radeon GPU of the APU can take advantage of Dual Graphics, where a discrete Radeon card can be teamed up with the APU's graphics for extra performance. All desktop APUs contain the UVD 3 video-processing block that hardware-accelerates Blu-ray 3D, MPEG-2 and DivX/Xvid content, leaving the four CPU cores free for other tasks. 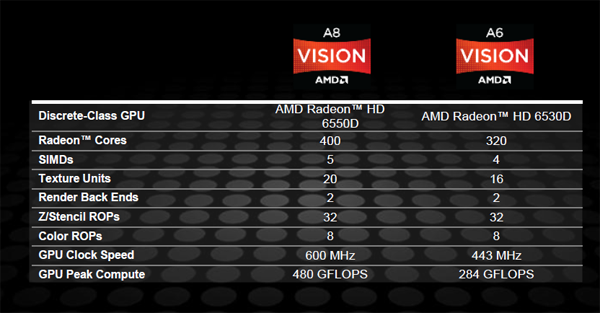 AMD is only divulging the pricing for the A8-3850 APU presently, which is due to retail for around $135 (£99). Common sense and an educated guess dictate the three other desktop APUs will punch in at £60-£90. The pricing is informative insofar as AMD is positioning them against Intel's Core i3-21x0 chips ($117-$138) whereas the cheapest desktop Core i5 currently fetches $177 on list prices..
AMD grabs all the know-how from manufacturing mobile A4, A6 and A8 APUs and uses it for the desktop chips. Based on practically the same architecture but clocked in at higher speeds due to a larger power budget - 65W and 100W - the desktop A6 and A8 can be thought of as scaled-up versions. But AMD's designed these APUs for mainstream computing and priced them accordingly. As such, they compete against Intel's Core i3 Sandy Bridge chips rather than take on the might of the APU-like Core i5 and Core i7. Consumers looking for premium APU performance will need to wait until 2012 when AMD is set to introduce the revamped 'Trinity' silicon that's based on the upcoming Bulldozer cores and an upgraded DX11 GPU.